Many professions have codes of ethics, a common set of guiding principles that help you make fair decisions. Codes often protect both the worker and client from poor business practices. Designers working in a team or individual environment should be working with a code of ethics. Many designers might even follow multiple codes – one set by an employer, one set by professional organizations and one that is a more personal set of rules and guidelines. 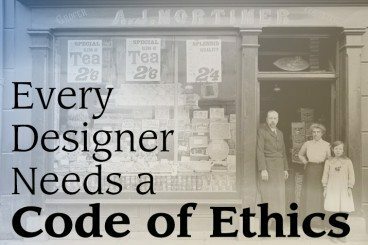 One thing is certain: Every designer needs a code of ethics. Although there are various points in every code of ethics, most contain a key set of principles. Codes often outline the designer’s responsibility to clients, how designers should interact with each other, the designer’s responsibility to the public and environment, fees and compensation and basic conduct (including honesty and fair competition). The principle defines the basic way in which you will interact with clients. Concepts include conflicts of interest, confidentiality and professional responsibility and behavior. How you decide to interact with clients is important and will set the tone for who hires you and the reputation you earn in the industry. How designers work with and interact with each other is just as valuable of a concept as working with clients. Items that are often covered by the principle include taking or working on projects started by other designers; fair and open competition in business; objectivity; honoring all others’ work including copyrights, trademarks and other design property; and working within other relevant and generally accepted codes of conduct. Designers should also think about how they work they produce can impact the people who will see it. This audience includes the public at large, distinct customer groups and the community in which the designer works and lives. Things to consider include taking projects that could result in some degree of harm to the public, the communicated message and its truthfulness, mutual respect of the audience, discriminatory actions and obligation to serve the community. One of the things that classifies a professional design as such is the collection of fees and payment for work. A good code also outlines fees and payments, what kinds charges are acceptable, when taking a fee could cause potential conflict, how contracts should be maintained and honored, and provisions for estimates (if applicable). Often ethical codes outline basic rules of professional conduct. This refers to understanding and obeying all applicable laws but also good and fair business practices. Some things to consider include the ability to accept gifts for work, refusing work that is unlawful or fraudulent and working (or refusing to work) on projects that are purposefully misleading or deceptive in a way that can cause harm. Most professional organizations have a code of ethics or standard practices that are a good place to start. If you are a member of these organizations, you likely signed off on the group’s specific code, saying that you would work in such a manner that upholds it. Developing your personal code of ethics is just as important as following one set by a business or professional group. There are certain parts of the job that are more important or linked to certain belief systems for different designers. If it matters to you and will impact the way you work, it should be part of your individual personal/professional code of ethics. He connects each of these 12 words into a “Designer Law” that defines how designers should work in terms of “finding, hiring and building a long-term, working relationship with a graphic designer.” He maintains that these 12 words embody characteristics that every designer should have (or at least try to maintain). When developing a code also consider different work practices and whether they are acceptable: Will you do pro bono (or free work)? Is entering design contests or competitions important? Will you work on spec or contingent basis? How will you bill and price work (flat, hourly, provide estimates)? How will clients conflicts be resolved? Once you’ve settled on a code (or two) to follow, it is important to maintain and uphold said principles and practices. Sometimes this can be tricky and difficult. So how can you do it? The first step is to stay current with code changes or revisions. Professional organizations often revisit the code annually. Make it a goal to read through it at least once a year as a refresher. Make sure to keep codes that you maintain (or help revise) current with technology. As new methods of creating work are used, they should be addressed in ethical guidelines. Not only should you know what codes of ethics you will work by, it can be a good idea to let your clients know as well. People like to work and do business with other groups that follow similar business practices. This can make it easier for you to work with a client because they will understand up front how you plan to work and do business. In addition to helping you better work with clients, having a clear code of ethics can help you solve problems that fall in gray areas before they really become problems. Any issue that comes up should pass each standard of ethical behavior. If you maintain and follow your own guidelines, you won’t end up in as many tricky situations. The way you conduct yourself and business requires careful consideration. Aside from legal concerns, there are not a lot of specifically right or wrong answers when it comes to ethics. The key is creating working guidelines that mesh with your business and personality. What is acceptable for one company may not be for another. What codes of ethics do you follow? Is there an organization code that you feel fits your work and professional goals and standards best? Share your thoughts with us in the comments, on Facebook or Twitter.